STANDARD Chartered Bank has introduced fingerprint / touch identity login for its mobile banking Application – SC Mobile. This new exciting feature allows customers to log into SC Mobile using Biometric (fingerprint) technology, making mobile banking access even faster with a single touch. Best of all, the fingerprint password is safe, secure and one will always have it. 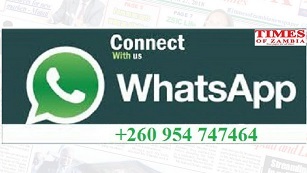 currently being accessed by over 16,000 Zambian customers. will not always allow time to physically visit a branch. “As we celebrate 110 years in Zambia, Standard Chartered Bank is delighted to add yet another innovation to digital banking. Our brand new SC Mobile fingerprint/Touch ID feature is designed to bring banking directly to our clients in a safe, secure way and meet their individual lifestyle needs,” Mr Zulu said. SC Mobile is designed to suit clients’ lifestyle needs, offers convenient banking and access to accounts anytime, anywhere. The latest fingerprint login feature will enhance SC Mobile as an intelligent, convenient and safe way to do banking.